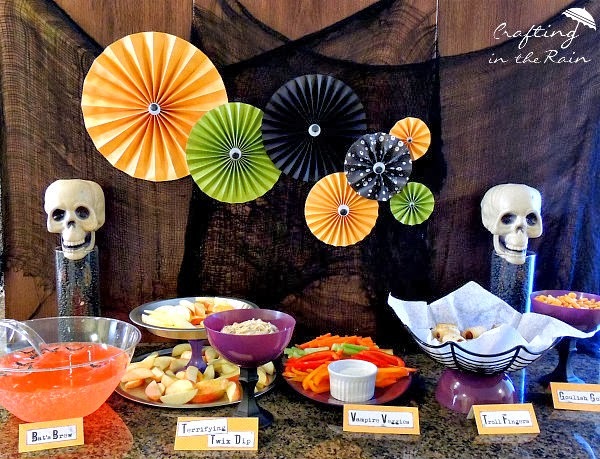 These Halloween recipes and games for kids are perfect for a preschool party, class party, or fun afternoon at home. They are easy to make, fun to eat and play, and no crazy clean up. My preschooler was so excited when I told him we’d be having a Halloween party with some of this friends while his sisters were in school. We kept it pretty low key with just a few guests and some simple foods and Halloween recipes. That’s really more our speed anyway. To decorate, I made some paper medallions with googly eyes in the center. Paper clips on the back worked perfectly to hang them from the black gauzy fabric as my background. I bought it at the dollar store, so it’s a nice inexpensive way to decorate large spaces. As everyone was arriving, we made washi tape mummies. After we ate it was time for some games. 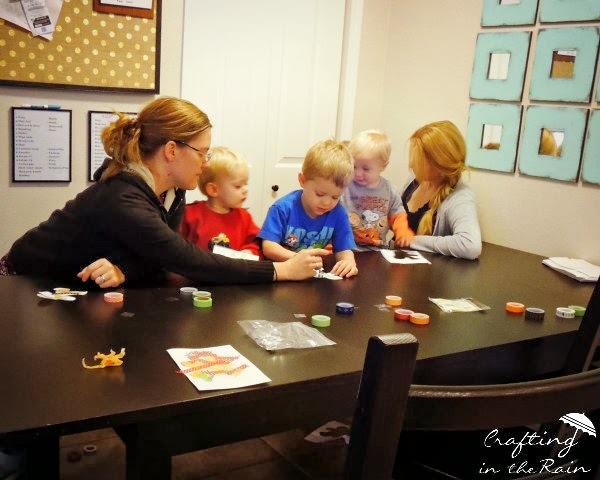 We played the sticky spider web game I created for Brassy Apple and used the bean bags I made for Craftaholics Anonymous. In each bucket we put a fun size candy…Twix, M&Ms or Snickers. Each guest was able to throw bean bags until they’d won 3 prizes. You can see in the picture below, we were pretty easy-going on the rules for how far you had to be from the buckets! 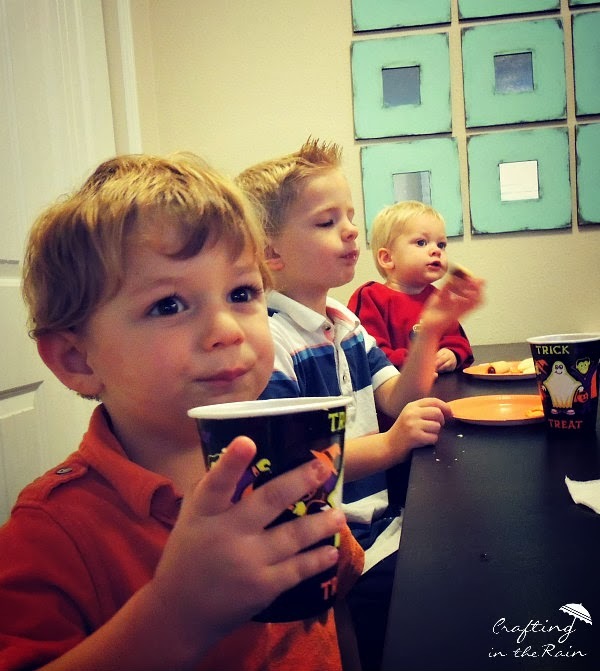 I know Asher and I had fun with a bunch of our friends over, and I’d say the party was a success! 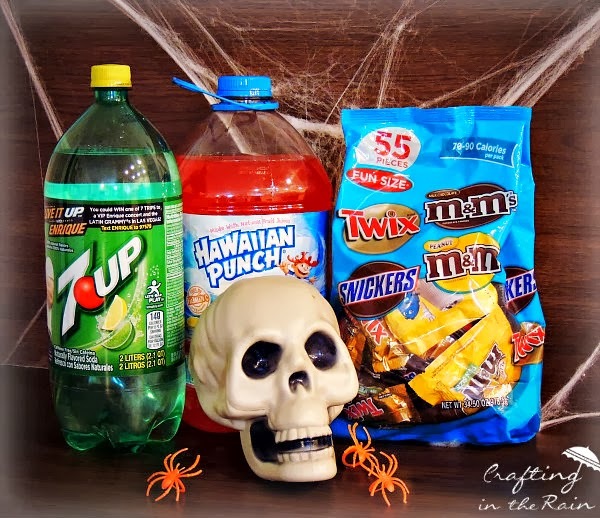 If you need some Halloween recipes in the next few days, give these a try! Combine cheese and brown sugar. Chill Twix in the freezer for about an hour for easier chopping. 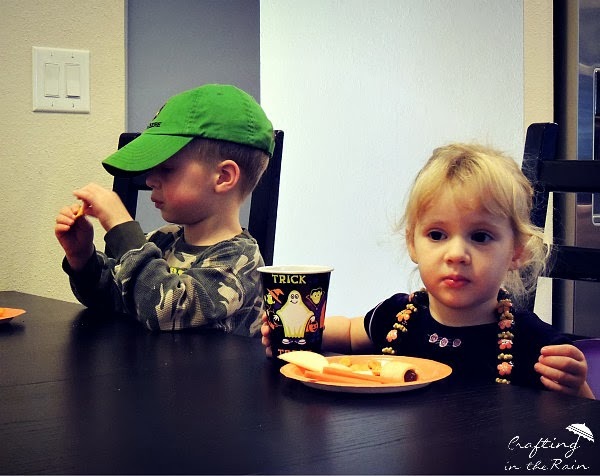 Add candy to dip right before serving. 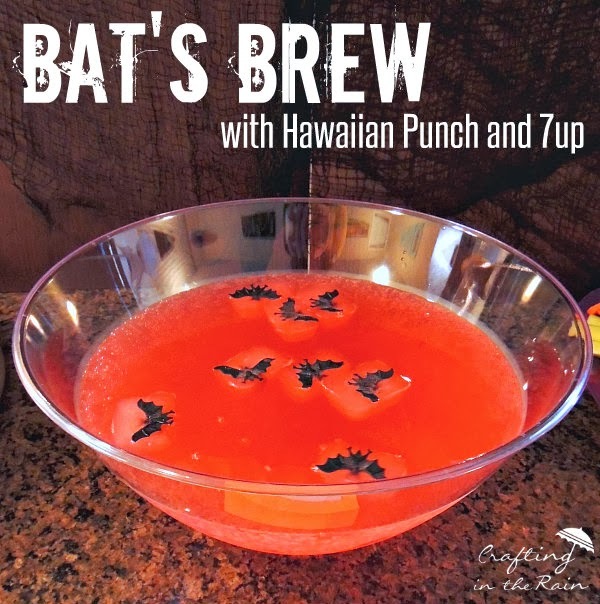 Fill tray with Hawaiian Punch and set a bat in each one. Freeze overnight. Combine 6 cups 7up and 3 cups Hawaiian Punch in a large bowl. 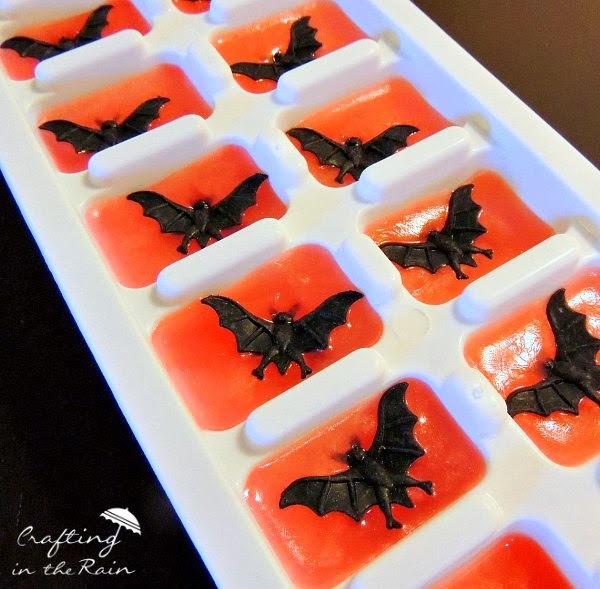 Just before serving, remove bat ice cubes and add them to the punch. 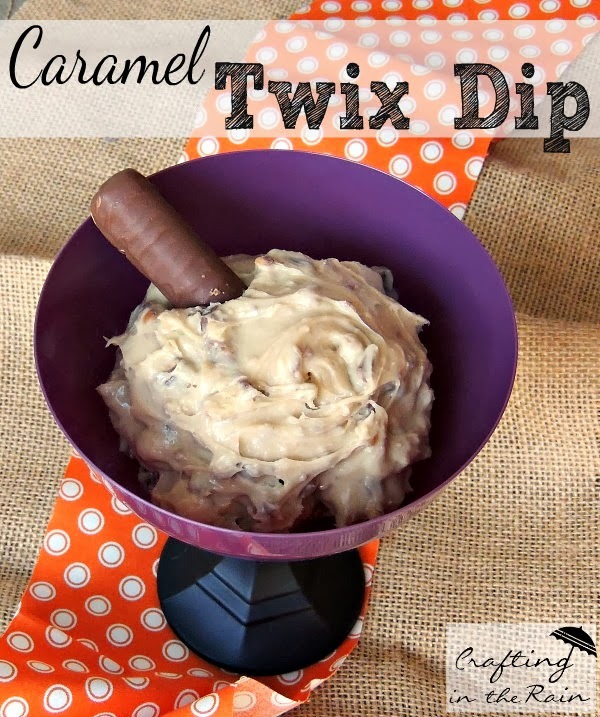 I might have to make that Twix Dip soon!